Headmaster Hikoki Ohara and Prof. Hirokazu Yokohigashi during a live demonstration. SAN MARINO — The Los Angeles Chapter of the Ohara School of Ikebana celebrated their milestone 50th anniversary on Oct. 21. The Huntington Library, Art Collections, and Botanical Gardens served as the beautiful setting for this ceremony. 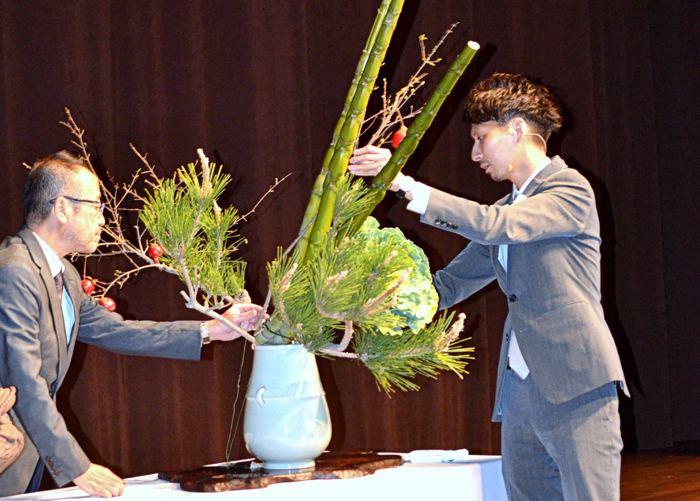 The fifth headmaster of the Ohara School of Ikebana, Hiroki Ohara, together with Professor Hirokazu Yokohigashi, both from Ohara headquarters in Japan, highlighted the event, conducting live demonstrations before an audience that numbered over 350 people. The demonstrations used many dramatic materials, some of which were sourced or grown locally in Los Angeles, including plant materials from The Huntington’s Botanical Gardens. The director of The Huntington Botanical Gardens, Dr. James P. Folsom, welcomed and addressed the audience. The Huntington has a distinguished history, including a formal Japanese Garden with a ceremonial teahouse and an authentic Japanese house that is more than 100 years old. In 2016, Dr. Folsom was presented the Order of the Rising Sun, Gold Rays with Rosette by the Japanese government. Robert Hori, Huntington Gardens cultural curator and programs director, worked with local chapter members to organize this event. 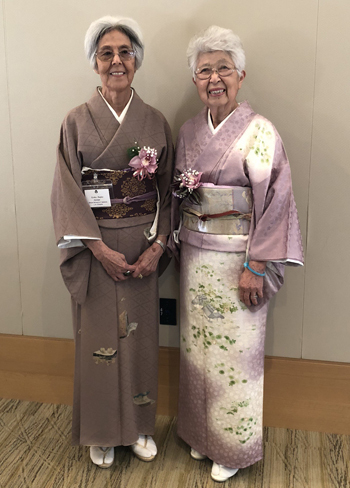 A reception at The Huntington’s Rothenberg Hall followed the live demonstrations, Two founding members, Hokyu Repko and Shofu Shohara, together with Reiga Kawamura and Mona Lutz, were presented special recognition awards for their years of dedicated service. The Los Angeles Chapter was formally established in 1966 after a decade-long effort that was culminated when third Headmaster Houn Ohara arrived with a goodwill delegation of 150 people from Japan to help commemorate its founding. The Ohara School of Ikebana has global reach with local chapters across major continents. The Los Angeles Chapter remains one of the most active and largest chapters across North America, with over 100 members who conduct seminars, exhibitions and workshops throughout the year. The Los Angeles Chapter is currently led by Satsuki Palter, chapter president.